One of the first procedures that patients receive when they come in the dental office is a dental exam. When a person takes his seat on the chair, he will be asked to open his mouth and with a mirror in hand, to check status of the oral cavity. 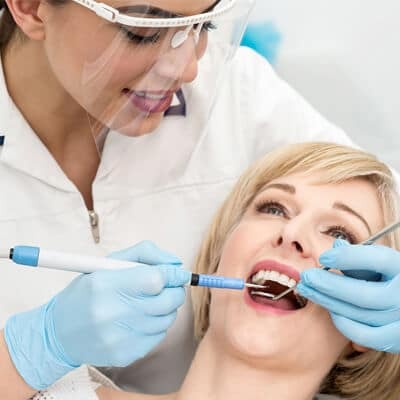 A complete dental exam is made up of a series of steps that enables a dental professional to detect the presence of problems so that a proper dental treatment can be given. Some patients may regard the dental exam as excessive and unnecessary. Some patients come into the clinic with a specific chief complaint and they want these problems addressed right away. A thorough dental exam is always in order, if not to properly assess the nature of the chief complaint, it is essential so that unseen problems are detected earlier on. Oral Examination: In the oral examination, a few things are performed. First there is visual inspection, where the dentist passes through every tooth surface and every area of soft tissue in the mouth to detect signs of problems and abnormality that may indicate the presence of disease. Using a mouth mirror and an explorer, everything is checked. Palpation and percussion is also performed. Palpation is the process of running one or two fingers across an area to feel for bumps and growths along the soft tissue area. Percussion is performed with the blunt end of the mouth mirror tapped onto the surface of a few teeth, to confirm the presence of periapical growth or lesions. Dental Photography: Photographs are taken for many reasons. First it is taken to increase visualization, and may be done by a normal camera or an intraoral device. Second it is performed to be used during patient education, to give the patient a better means to grasp what is going on in his mouth. Third the photographs may be kept for record purposes not merely for the diagnosis of disease. Dental Radiography: When the problem is not detected through visual inspection, a more definitive way of diagnosis oral condition will be to take a dental radiograph. There are different types of x-rays used in dentistry, each one takes a different picture and serves a specific purpose. It gives a two-dimensional picture of the tooth, the bone and all pertinent structures, in a view that is unseen by the naked eye. Dental Impression and Casting: Another procedure performed in the dental office during an examination is the impression taking and casting. This is to create a three-dimensional representation of the upper and lower jaws in occlusion. It serves a useful purpose in diagnostic procedures in orthodontics, dental implants and the fabrications of dental crowns and dentures. Laboratory Testing: Although this is not a common practice, some dental examinations may require the need for laboratory testing to better identify a symptom of a condition. With instructions from your dentist, certain tests will be taken to be able to make a thorough assessment of your true health condition. One or all of these procedures shall help the dentist in the diagnosis and treatment of disease. It is a crucial part of every dental appointment. It is never skipped and never rushed.